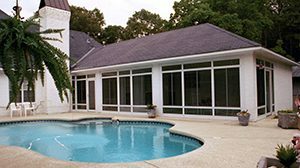 Screen rooms are a fantastic investment for homeowners in Milton, Florida, who are looking to upgrade their residences. A screen room can maximize the overall space – and the overall value – of your home, providing a wonderful area to take in the beautiful views of your backyard while staying protected from pesky insects and harmful UV rays. For a company you can trust to install a durable screen room at your home, turn to Majors Home Improvement. We solely install screen rooms from TEMO, one of the most popular outdoor living manufacturers in the country. Our craftsmen are highly trained and experienced, and they even provide all-star treatment by following our Red Carpet Service checklist. This checklist includes keeping a clean worksite and being mindful of plants and pets. We hold an A+ rating with the Better Business Bureau, which speaks to our commitment to providing our customers with top-notch service. The screen rooms we install are built to last; they are made of extruded aluminum, which is a highly durable material. What’s more, they feature lightweight vinyl sashes that block 99 percent of UV rays, large window openings that provide maximum ventilation, and thermal roofs that deflect the sun’s heat. To schedule a complimentary consultation at your home in the Milton, FL, area, contact Majors Home Improvement today. We’ll be pleased to discuss our screen rooms and installation services in greater detail. Your New Patio Is One Click Away!